Eddie Alvarez thought Conor McGregor reached an unnecessary low Thursday. 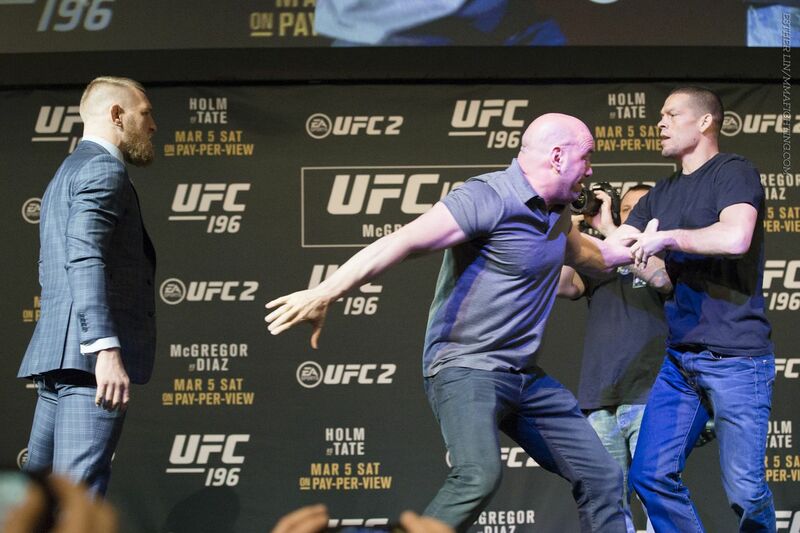 McGregor slapped Nate Diaz’s hand away during their faceoff following a UFC 196 pre-fight press conference at MGM Grand. The two will meet in the main event Saturday. After the slap, the two men had to be separated and both of their teams got involved. There were no more physical altercations, but it could have devolved into something even worse. Alvarez, a top lightweight contender, wasn’t a fan of the whole thing. He tweeted that it was “p*ssy sh*t” by McGregor and that he should be fined for it. Jon Jones and Daniel Cormier were both fined by the Nevada Athletic Commission for their roles in an August 2014 brawl inside the MGM Grand during a press event. Jones was fined $40,000 and Cormier $9,000. Ironically, those two men will fight again at MGM Grand in a few weeks, on April 23 in the main event of UFC 197. Alvarez was a candidate to fight Diaz next before Diaz stepped into face McGregor last week when Rafael dos Anjos pulled out with a broken foot. Alvarez and Diaz got into a verbal altercation during UFC 188 fight week in June 2015. Alvarez was fighting Gilbert Melendez, Diaz’s teammate, on the card.